Joint in a tie beam inside the main roof of Salisbury Cathedral UK. 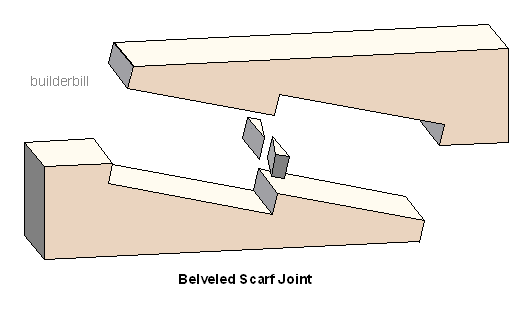 The angled and wedged scarf joint above has had a couple of attempts at reinforcing the original joint. In actual fact many of these joints were bolted or otherwise strengthened from the beginning. One method was sandwiching the timber joint between two flat iron plates with bolts tying them together. These were known as Fish Plates. Above is a sketch of the joint in the photo above. There are many variations on this theme of scarf joints, but for the most part heavy structural timber and it's joints have been superseded by other materials in modern construction.